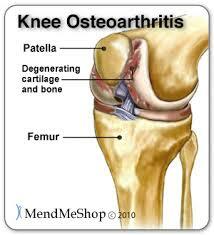 FACTORS WHICH INCREASE THE CHANCES OF DEVELOPING KNEE OSTEOARTHRITIS. Can ing determine your arthritis risk? Would you want to know whether your genes put you at a high risk for developing knee osteoarthritis, especially because of your family history, where you might first-hand have witnessed the suffering of someone close to you? The pain from knee arthritis is devastating and can severely limit mobility. The knees are possibly the most important joints in the body, as they have to support the entire bodyweight day in and day out. Constant knee pain has to be medically checked or knee osteoarthritis could develop which might result in a total knee replacement to obtain relief. Heredity does play a part in arthritis, but this is not always the case. If there is osteoarthritis in your family, it does not necessarily mean that you will inherit the problem. Arthritis is not the typical type of inherited genetic disease like haemophilia or cystic fibrosis. Is there a specific test I can take? You can ask your doctor to sign you up for a DNA test if you have a close family member who suffers from arthritis or . The results will give a broad result as to whether or not you are at risk from a genetic reason. However, a negative result does not mean you will not eventually have swollen, painful knees that make it a struggle to move or get out of bed in the morning! Likewise a positive report stating that you have predisposing genetic factors for developing arthritis, does not mean that you will inevitably have knee pain, knee arthritis and a possible knee replacement. Besides genetic reasons, there several other aspects which could determine whether someone is likely to develop arthritis. Can I prevent arthritis developing? Regardless of your family history or genes, there are steps you can implement which can substantially lower your arthritis risk. Overweight and obesity. 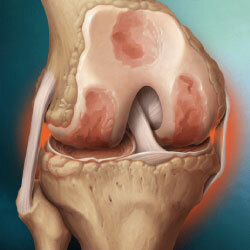 Excess weight contributes to both the onset and progression of knee osteoarthritis. Make an effort to shed the excess weight you may be carrying. Joint injuries, mainly from sporting activities or a fall. If you constantly, or even just occasionally, suffer knee pain from these issues, visit your medical practitioner to prevent more serious problems later in life. Cultivate good lifestyle habits. Quit smoking if you want to keep walking! Eliminate as many acidic foods as you can from your diet, and keep exercising.